» Forum » Game manufacturers » Jersey Jack Pinball » Will Wonka be more popular than POTC? » Will Wonka be more popular than POTC? Will Wonka be more popular than POTC? Maybe? Check back in one year after more people have time on both pins. Hope for companies sake it is. I’m going to call it now and say yes. Yes. And with the SE price reduction some geos, like here in Ontario, will see a savings of just over $1,500 CAD when you factor in current conversion + taxes. It may be more popular as theres a cheaper model. Does that mean it will be better? No. Personally I much prefer a rocking pirate ship with 2 loops, variable speed, and canon shot over a spinning Gobstopper that does not interact with the ball and a rotating gobble hole. Also, where are the movie assets and memorable songs from the film in Wonka? There's some in there and while you see the video of the actors you don't hear their voices. I don't get it. Wow, I wasn’t aware the SE was 1K less! By the looks of it, I'd say no. Wonka looks OK but pirates is incredible. Yes. I played POTCJJ and it was confusing with all the characters and the ball times were too long. Wonka would have an easy time beating it. Oh boy another wonka thread. Play them both and find out for yourself. Wonka presales have went well past potc production and preorders.... i hope jjp can get them out fast enough....but i think it will be very popular. The game shoots awesome and has a ton of shots. It is beautiful and has a lot going for it and its very early on. Potc is fun and a fine pin but it didn't do well and won't take much for Wonka to be more popular. Actually it’s $2000 less based on the Wonka standard/Limited price level between models. Definitely a step in the right direction good for operators and homebuyers wanting to get in on this game. Based on the previous game releases it’s $1000 less on the standard model As previous standard models were $8500. Wonka is woz 2.0 so no. Let’s just ff to toy story and gnr already. The new price structure on these kind of bums me out. I own both a Hobbit and WOZ and like them both. I also own a Data East Guns and Roses and is one of my favorite pins. If this is the price structure of things to come, buying top of the line NIB GNR is going to be a touch pill for me to swallow. Even though I really want one. I fully expect it to be more popular considering potc is already pulled from the line. Now is it a better game? Played both Pirates and Wonka at the show. I thought pirates was the much more innovative game and Wonka had the better layout. This is a great summary. I think potc it's def more innovative but Wonka layout and pure butter feel looks great too. I might want both. I have played both... I like Wonka better however both are amazing games. Pirate owners are lucky folks. It shoots like a dream. And the Mechs are awesome. Wonka is the real deal guys. 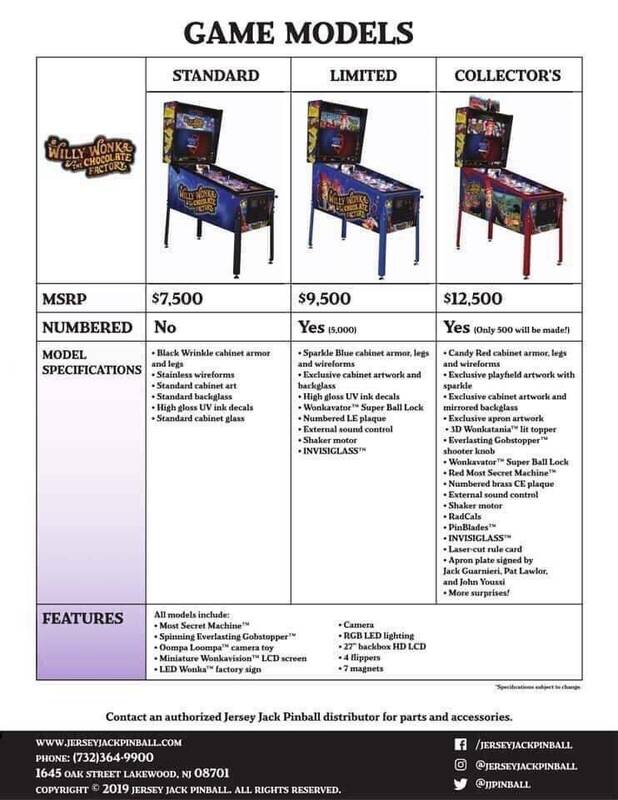 I think Wonka is going to be an easier game for non-pinball people to have fun with on location, which means more quarters, while still attracting pinball people. The price of 7500 is also much more attractive than 8500 for locations who want premium games. JJP themes are so polarizing. Wonka layout is a 10/10. But, think there are enough people who will prefer this theme to POTC and WONKA shoots better. Absolutely, it will sell tons more on theme alone. Like WOZ, it's an evergreen family classic that many people have deep nostalgia for. That sells games, period. No one has that type of nostalgia for POTC...it was hot for the first 2, maybe 3 movies when Stern's POTC came out...then it (and Johnny Depp) wore out it's welcome. The theme is actually a net negative, for the most part. It’s the everlasting gobstopper of topics! Just looking at the two franchises without gameplay, wwcf is the clear choice for me. Wonka is a beloved movie from my youth that whenever is on tv, I stop and watch. The other is a franchise about pirates, that I have no connection with having never seen 5 minutes of any potc movie. If I walked in a bar and the two games were beside each other, wonka is getting my monies. But hey, that's just me. Great! But your first post asks a different question to your title (and poll). Theme wise yes gameplay wise we will have to wait and find out as more people play it. They will sell more Wonka than Pirates on theme alone, plus they have stopped making Pirates. So, more Wonkas will be sold, no question. However, which one will be the better game 2 years from now is a better question. Right now I would say Pirates. The biggest thing it has over Wonka after playing both is speed. I hope they sell lots and lots of Wonkas so they stay in business. I have zero interest in Wonka and kind of feel left out that I have zero nostalgia for the theme. But, I want them to have wild success as a company as I am certain they will make another theme someday that I can’t resist. They truly do set the standard in the pin world. Even just the multi outlanes on POTC with the nudge back into the shooter lane makes it a great game. I don’t think POTC is very popular, at least given the fact that production has stopped and that distributors still have them available. To me the real question is Will Wonka be more popular than WOZ, the latter being JJP major hit so far. Not popular? Try to find an LE. Production stopped because demand was miscalculated and they ran out of parts. They now have to move on to the next game so potc stops. Its popular now that its no longer available and people like me who were waiting for a used one on the cheap scrambled for one of the last remaining musical chairs. More likely than not- production stopped because demand was low so they cut off the reorders of parts and prepared the line for Wonka and "glitter WoZ." Sometimes it takes a little while for a game to be appreciated.